The global temperature record represents an average over the entire surface of the planet. The temperatures we experience locally and in short periods can fluctuate significantly due to predictable cyclical events (night and day, summer and winter) and hard-to-predict wind and precipitation patterns. But the global temperature mainly depends on how much energy the planet receives from the Sun and how much it radiates back into space—quantities that change very little. The amount of energy radiated by the Earth depends significantly on the chemical composition of the atmosphere, particularly the amount of heat-trapping greenhouse gases. The maps above show temperature anomalies, or changes, not absolute temperature. They depict how much various regions of the world have warmed or cooled when compared with a base period of 1951-1980. (The global mean surface air temperature for that period was estimated to be 14°C (57°F), with an uncertainty of several tenths of a degree.) In other words, the maps show how much warmer or colder a region is compared to the norm for that region from 1951-1980. Global temperature records start around 1880 because observations did not sufficiently cover enough of the planet prior to that time. The period of 1951-1980 was chosen largely because the U.S. National Weather Service uses a three-decade period to define “normal” or average temperature. The GISS temperature analysis effort began around 1980, so the most recent 30 years was 1951-1980. It is also a period when many of today’s adults grew up, so it is a common reference that many people can remember. 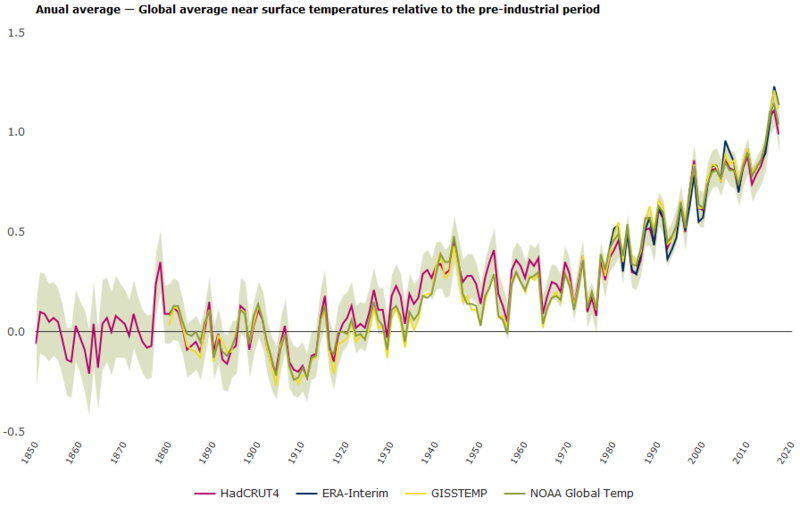 According to different observational records of global average annual near-surface (land and ocean) temperature, the last decade (2008–2017) was 0.89 °C to 0.93 °C warmer than the pre-industrial average, which makes it the warmest decade on record. Of the 17 warmest years on record, 16 have occurred since 2000. The year 2017 was one of the world’s three warmest years on record together with the years 2016 and 2015. The average annual temperature for the European land area for the last decade (2008–2017) was between 1.6 °C and 1.7 °C above the pre-industrial level, which makes it the warmest decade on record. In Europe, 2017 was colder than the previous 3 years. Climate models project further increases in global average temperature over the 21st century (for the period 2081–2100 relative to 1986–2005) of between 0.3 °C and 1.7 °C for the lowest emissions scenario (RCP2.6) and between 2.6 °C and 4.8 °C for the highest emissions scenario (RCP8.5). All UNFCCC [United Nations Framework Convention on Climate Change] member countries have agreed on the long-term goal of keeping the increase in global average temperature to well below 2 °C compared with pre-industrial levels and have agreed to aim to limit the increase to 1.5 °C. For the three highest of the four RCPs, the global average temperature increase is projected to exceed 2 °C compared with pre-industrial levels by 2050. Annual average land temperature over Europe is projected to increase by the end of this century (2071–2100 relative to 1971–2000) in the range of 1.0 °C to 4.5 °C under RCP4.5 and 2.5 °C to 5.5 °C under RCP8.5, which is more than the projected global average increase. 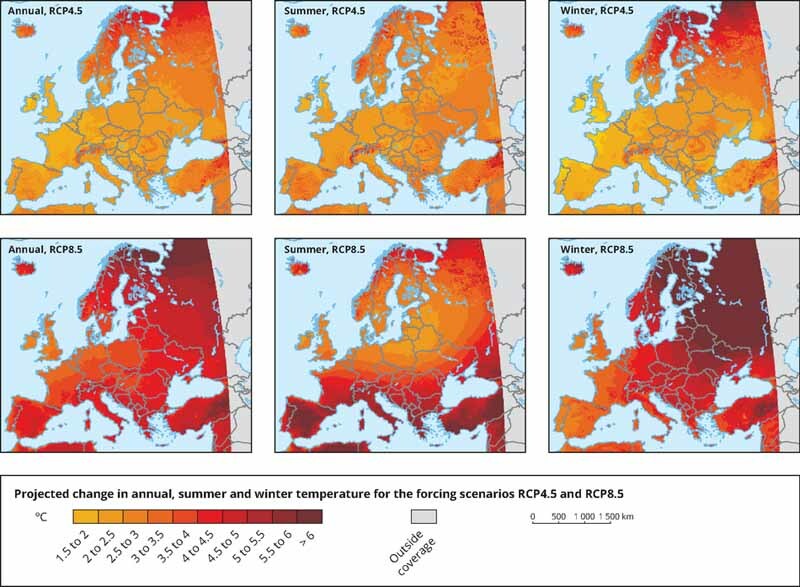 The strongest warming is projected across north-eastern Europe and Scandinavia in winter and southern Europe in summer. The number of warm days (those exceeding the 90th percentile threshold of a baseline period) have doubled between 1960 and 2017 across the European land area. Europe has experienced several extreme heat waves since 2000 (2003, 2006, 2007, 2010, 2014, 2015 and 2017). Under a high emissions scenario (RCP8.5), extreme heat waves as strong as these or even stronger are projected to occur as often as every two years in the second half of the 21st century. In southern Europe, they are projected to be particularly strong. Whichever regime prevails, temperatures, occasions, heat-associated deaths, extinctions, and more are all set to rise, with Home Sapiens able only to mitigate the degree. Are we approaching a critical threshold? Threshold events in which dramatic changes are triggered by small shifts in existing conditions. Water is water until it hits the freezing point, and ice stays ice until its temperature reaches the same point. What was liquid becomes solid, what was solid becomes liquid. We also know from everyday experience that cold shows living things down, while freezing generally brings them to a halt. The threshold at which ice melts is shaping up to have major impacts on global warming, both through the release of trapped methane in the Arctic permafrost [about which we’ve posted extensively] and for the generation of new greenhouse gases in the form of carbon dioxide generated by microbes now able to digest dead organic matter at above-freezing temperatures. The findings come from Pacific Northwest National Laboratory, a highsecurity facility in Richland, Washington, run by the Department of Energy and focusing on terrorism, nuclear proliferation, cyberwar, energy independence, and climate change. Unlike the White House, th national security establishment sees climate change as a real threat, so much so that it’s a matter of national security. The vast reservoir of carbon stored beneath our feet is entering Earth’s atmosphere at an increasing rate, most likely as a result of warming temperatures, suggest observations collected from a variety of the Earth’s many ecosystems. Blame microbes and how they react to warmer temperatures. Their food of choice – nature’s detritus like dead leaves and fallen trees – contains carbon. When bacteria chew on decaying leaves and fungi chow down on dead plants, they convert that storehouse of carbon into carbon dioxide that enters the atmosphere. “It’s important to note that this is a finding based on observations in the real world. This is not a tightly controlled lab experiment,” said first author Ben Bond-Lamberty of the Joint Global Change Research Institute, a partnership between the Department of Energy’s Pacific Northwest National Laboratory and the University of Maryland. “Soils around the globe are responding to a warming climate, which in turn can convert more carbon into carbon dioxide which enters the atmosphere. Depending on how other components of the carbon cycle might respond due to climate warming, these soil changes can potentially contribute to even higher temperatures due to a feedback loop,” he added. Globally, soil holds about twice as much carbon as Earth’s atmosphere. In a forest where stored carbon is manifest in the trees above, even more carbon resides unseen underfoot. 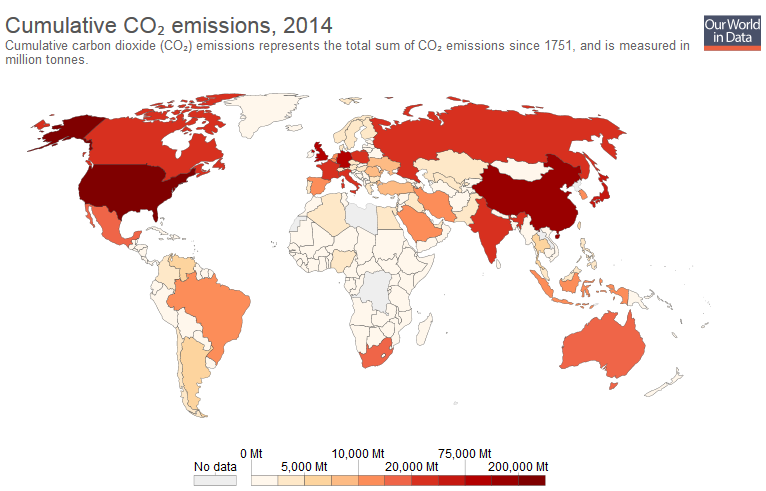 The fate of that carbon will have a big impact on our planet. Will it remain sequestered in the soil or will it enter the atmosphere as carbon dioxide, further warming the planet? The study focused on a phenomenon known as “soil respiration,” which describes how microbes and plants in the soil take in substances like carbon to survive, then give off carbon dioxide. Soils don’t exactly breathe, but as plants and microbes in soil take in carbon as food, they convert some of it to other gases which they give off – much like we do when we breathe. Scientists have known that as temperatures rise, soil respiration increases. Bond-Lamberty’s team sought to compare the roles of the two main contributors, increased plant growth and microbial action. New research reveals yet another alarming dimension of the climate change process, adding another powerful accelerant to the forces, many of them human in origin, driving the dramatic climate change now underway. And this is yet another sign of the complexity of climate change, evidence that rising temperatures can trigger releases of still more forces that make the earth hotter as thresholds are crossed. The irony is that the research comes from the U.S. Department of Energy, a federal agency in a government headed by a climate change skeptic/denier [it depends on his whim of the moment]] who his appointed many other climate change deniers to high posts in his administration. I’m not here to debate what’s not debatable. I mean, the evidence is overwhelming. The science is clear, certainly clear for the level that one needs for policymaking, in terms of the real and urgent threat of climate change. With Big Oil running the show, we suspect things will get much worse. Soils could release much more CO2 than expected into the atmosphere as the climate warms, according to new research by scientists from the Department of Energy’s Lawrence Berkeley National Laboratory (Berkeley Lab). Their findings are based on a field experiment that, for the first time, explored what happens to organic carbon trapped in soil when all soil layers are warmed, which in this case extend to a depth of 100 centimeters. The scientists discovered that warming both the surface and deeper soil layers at three experimental plots increased the plots’ annual release of CO2 by 34 to 37 percent over non-warmed soil. Much of the CO2 originated from deeper layers, indicating that deeper stores of carbon are more sensitive to warming than previously thought. They report their work online March 9 in the journal Science [$30 for 24-hour access]. The results shed light on what is potentially a big source of uncertainty in climate projections. Soil organic carbon harbors three times as much carbon as Earth’s atmosphere. In addition, warming is expected to increase the rate at which microbes break down soil organic carbon, releasing more CO2 into the atmosphere and contributing to climate change. But, until now, the majority of field-based soil warming experiments only focused on the top five to 20 centimeters of soil—which leaves a lot of carbon unaccounted for. Experts estimate soils below 20 centimeters in depth contain more than 50 percent of the planet’s stock of soil organic carbon. The big questions have been: to what extent do the deeper soil layers respond to warming? And what does this mean for the release of CO2 into the atmosphere? “We found the response is quite significant,” says Caitlin Hicks Pries, a postdoctoral researcher in Berkeley Lab’s Climate and Ecosystem Sciences Division. She conducted the research with co-corresponding author Margaret Torn, and Christina Castahna and Rachel Porras, who are also Berkeley Lab scientists. “If our findings are applied to soils around the globe that are similar to what we studied, meaning soils that are not frozen or saturated, our calculations suggest that by 2100 the warming of deeper soil layers could cause a release of carbon to the atmosphere at a rate that is significantly higher than today, perhaps even as high as 30 percent of today’s human-caused annual carbon emissions depending on the assumptions on which the estimate is based,” adds Hicks Pries. The need to better understand the response of all soil depths to warming is underscored by projections that, over the next century, deeper soils will warm at roughly the same rate as surface soils and the air. In addition, Intergovernmental Panel on Climate Change simulations of global average soil temperature, using a “business-as-usual” scenario in which carbon emissions rise in the decades ahead, predict that soil will warm 4° Celsius by 2100. New robot breed needed for Fukushima reactors. Given that the the radiation from a fuel melt-through has rendered one of the plant’s quake-shattered reactors so hot that the radiation is killing the robots sent to insect the damage. The head of decommissioning for the damaged Fukushima nuclear plant said Thursday that more creativity is needed in developing robots to locate and assess the condition of melted fuel rods. A robot sent inside the No. 2 reactor containment vessel last month could not reach as close to the core area as was hoped for because it was blocked by deposits, believed to be a mixture of melted fuel and broken pieces of structures inside. Naohiro Masuda, president of Fukushima Daiichi Decommissioning, said he wants another probe sent in before deciding on methods to remove the reactor’s debris. The No. 2 reactor is one of the Fukushima reactors that melted down following the 2011 earthquake and tsunami. The plant’s operator, Tokyo Electric Power Co (TEPCO), needs to know the melted fuel’s exact location as well as structural damage in each of the three wrecked reactors to figure out the best and safest ways to remove the fuel. Probes must rely on remote-controlled robots because radiation levels are too high for humans to survive. Despite the incomplete probe missions, officials have said they want to stick to their schedule to determine the removal methods this summer and start work in 2021. Earlier probes have suggested worse-than-anticipated challenges for the plant’s cleanup, which is expected to take decades. During the No. 2 reactor probe in early February, the “scorpion” robot crawler stalled after its total radiation exposure reached its limit in two hours, one-fifth of what was anticipated. Euro area annual inflation is expected to be 2.0% in February 2017, up from 1.8% in January 2017, according to a flash estimate from Eurostat, the statistical office of the European Union. Looking at the main components of euro area inflation, energy is expected to have the highest annual rate in February (9.2%, compared with 8.1% in January), followed by food, alcohol & tobacco (2.5%, compared with 1.8% in January), services (1.3%, compared with 1.2% in January) and non-energy industrial goods (0.2%, compared with 0.5% in January). Note that the impacts will hit hardest on the poor, especially those soaring energy costs, which will mean higher prices for food, and still higher bills to heat and light homes use their cars for transportation to and from work — for those lucky enough to have jobs, especially in Greece and the other poorer nations hit hardest by the ongoing Great Recession. Founded in 1970, the Environmental Protection Agency is the one positive legacy left by Richard M. Nixon, one of America’s worst Republican Presidents, the only one forced to resign in disgrace because of his criminal conduct. The agency, charged with protecting folks from the worst environmental ravages wrought by corporations and developers, the EPA has played a major role in cleaning up the nation’s worst environmental disasters and preventing others. But with prominent members of the Trump administration opposed to the agency’s vary existence, California legislators announced new measures this week designed to replace threatened federal regulations with new state counterparts. Fearing a federal rollback of longstanding protections for air quality, clean water, endangered species and workers’ rights, California Democrats are pursuing legislation that would cement those environmental and labor regulations in state law. The trio of bills announced Thursday also seek to use state authority to block private development of federal lands in California and extend some safeguards to federal whistleblowers. De León and other state senators who joined him Thursday pointed to a litany of developments over recent months that compelled them to act: Trump calling climate change a hoax; proposals to eliminate the U.S. Environmental Protection Agency; the confirmation of Scott Pruitt, who as attorney general of Oklahoma repeatedly sued the EPA, to lead the agency. And it’s very real, with the Trumpies presented with uniquely circumstances boding ill for our world and our descendants. University of Florida Professor Emeritus of Political Science Walter A. Rosenbaum is uniquely suited to address the threat, being both an internationally recognized academic environmentalist and a former Special Assistant to the EPA’s Assistant Administrator for Policy Planning. For people concerned with environmental protection, including many EPA employees, there is broad agreement: The U.S. Environmental Protection Agency is in deep trouble. The Trump administration has begun the third, most formidable White House-led attempt in EPA’s brief history to diminish the agency’s regulatory capacity. Scott Pruitt, Trump’s newly appointed EPA administrator, is a harsh critic and self-described “leading advocate against EPA’s activist agenda.” Pruitt’s intention to reduce EPA’s budget, workforce and authority is powerfully fortified by President Donald Trump’s own determination to repeal major EPA regulations like the Obama’s Clean Power Plan and Climate Action Plan. Previous presidents have tried to scale back the work of the EPA, but as a former EPA staff member and researcher in environmental policy and politics, I believe the current administration is likely to seriously degrade EPA’s authority and enforcement capacity. This latest assault on EPA is more menacing than previous ones in part because of today’s Republican-led Congress. The Democratic congressional majorities forestalled most past White House efforts to impair the agency’s rulemaking and protected EPA from prolonged damage to its enforcement capability. Presidents Ronald Reagan (1981-1988) and George H. W. Bush (1989-1993) both sought to cut back EPA’s regulatory activism. Reagan was fixated on governmental deregulation and EPA was a favorite target. His powerful assault on EPA’s authority began with the appointment of Anne Gorsuch, an outspoken EPA critic, as EPA administrator. Gorsuch populated the agency’s leadership positions with like-minded reformers and supervised progressive reductions in EPA’s budget, especially for EPA’s critically important enforcement division, and hobbled the agency’s rule-making – a key step in the regulatory process – while reducing scientific support services. Bush’s forays against EPA authority were milder, consisting primarily of progressive budget cuts, impaired rule-making and disengagement from international environmental activism.